The long-awaited Revere Market Basket at Northgate is finally ready to open this Sunday, Oct. 26, and company executives said they are ready to take care of the customers who took care of them. At the Revere store on Monday, from left, David McLean, operations manager; Ron Lambert, store director; and William Marsden, director of operations. The store will open at 7 a.m. sharp. In the parking lot of the new Revere Market Basket at Northgate Monday morning, workers outside were spiffying up the outside and moving carriages inside – but they weren’t getting much done in between having to answer numerous questions from the excited passers-by, many that are greatly anticipating this Sunday’s (Oct. 26) opening at 7 a.m.
“Are you open today?” exclaimed one woman. “Are you going to have the roasted chicken there that I always buy at the other stores?” she asked. “We’ll have everything you need ma’am,” reassured the worker. For more than a year, the Market Basket store a short distance over the City Line in Revere has sat finished, but unoccupied. During that time the company went through some internal strife that resulted in a positive change within the ownership structure and an even greater affinity than already existed between loyal customers and the company. All of that’s over with now, and Market Basket officials William Marsden and David McLean happily announced on Monday that the Revere Market Basket would open for business at 7 a.m. Oct. 26, with an official Grand Opening/Ribbon Cutting scheduled for Thursday, Oct. 30. David McLean, operations manager at Demoulas, said they are very excited as a company to open the Revere store, which will be the first of five new stores in the region over the next several months. The additional stores to open before the end of this year will be in Waltham at the old Polaroid site and in Littleton. Stores in Attleboro and Athol will open in the 1st Quarter of 2015. The Revere store will be under Store Director Ron Lambert, who is a store opening specialist and has been with the company since 1976. The Revere store will be 80,000 sq. ft., which is a bit smaller compared to the 135,000 sq. ft. Goliath of a store in Chelsea. However, Lambert said they believe the size is perfect for the Revere area and they have streamlined operations in the storeroom to give as much shopping space as possible. Lambert said the “tasting station” is likely to be a hit with customers – outfitted with cooking equipment, a Bose PA system for sound and ample space for customers to listen to vendors and taste products. He said the first demonstration will likely be a new popcorn seasoning product – with customers able to try out a variety of flavored popcorn in the store. Another feature will be the ‘Butcher Block’ feature where Certified Angus Beef (CAB) will be highlighted prominently. The CAB products debuted about three years ago at Market Basket’s Westfield store and Lambert said it was an instant hit. He believes it will be reach the same popularity in Revere. He said the program is a non-profit comprised of cattle producers who choose only the most premium grades of beef for certification – that being based on fat marbling, bone structure and heritage of the animal. It all equals out into a mouth-watering steak or a scrumptious roast. “Once you’ve tried it, for $1 more, you won’t eat another piece of meat other than CAB again,” Lambert said. McLean said customers can be assured to have a full variety of healthy options integrated within the aisles and shelves. This, he said, is something that is necessary for a modern grocery store in accommodating new ways of eating – whether for better health or for medical reasons. The Revere store will also be a major job provider locally. Lambert said there are 460 new employees at the store, with 75 percent being from Revere. Another 100 employees have transferred into the Revere store from other nearby locations. 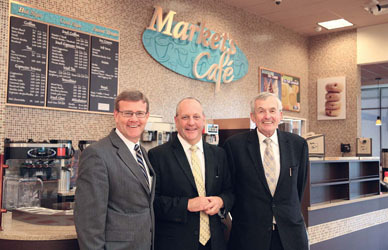 And in addition to the new things and old things in the front of the store that have made Market Basket so popular with customers – and so eagerly anticipated in Revere – the store will be a marvel of efficiency within its backroom operations. McLean and Lambert said the Revere store will have 90 percent LED lighting with some solar lights mixed in. There is a mandate to recycle – keeping trash in a separate stream from cardboard and plastic. In that spirit, virtually nothing is wasted. Cardboard is bundled for recycling. Clean plastic is wrapped into bales for reuse. Even produce that has gone beyond it’s date isn’t thrown out. Instead, Lambert said it is sent up to a New Hampshire farm where it’s used to feed pigs. And that kind of company mindset between Market Basket and its customers – after a harrowing summer of uncertainly – have never been more aligned. And in Revere, that alignment will mean a line of folks ready to come through the doors on Oct. 26. More than 1,000 employees, customers and store managers from around the region rallied at the Chelsea Market Basket parking lot on Tuesday afternoon in support of ousted DeMoulas President Arthur T. Demoulas. The fate of the Market Basket Mall expansion plans in Chelsea, and the brand new but unopened Northgate Mall in Revere, hangs perilously in the balance this week as the DeMoulas family squabble that started last fall has ratcheted up a notch due to the sudden ouster of the company president and two other key executives on Monday. The DeMoulas Board of Directors, controlled by Arthur S. DeMoulas, voted to fire President Arthur T. DeMoulas (Arthur S.’s cousin), and long-time executives William Marsden and Joe Rockwell. There was no immediate statement from the Board or Arthur S. DeMoulas other than a terse statement saying Arthur T. DeMoulas had not been retained. However, the ousted Arthur T. camp was very vocal – issuing a blistering statement, with some, such as long-time executive David McLean attending the Tuesday rally. McLean, who was instrumental in bringing the new Chelsea store to fruition several years ago, resigned his position on Monday in support of Arthur T. and the others. Marsden, the former director of operations at DeMoulas, said the action by the Board was nothing but greed. He added that those fired had a combined 110 years of experience, and he said he was fired for being devoted to Arthur T.
The battle lines were particularly harsh in the family battle. Arthur T. DeMoulas was seen as wanting to continue the lucrative and popular employee profit sharing program, and to continue opening stores in areas like Revere and Lynn – as well as expanding the shopping center plan in Chelsea. Arthur S. DeMoulas and the current Board has been seen as less open to the Chelsea and Revere expansion and to the employee profit sharing program that has existed for decades. The Revere store was completed more than one year ago, but has never opened. It sits in the Northgate Mall on Squire Road like a ghost that never had the pleasure of living. City Manager Jay Ash said he has always been impressed with Arthur T., or Artie, and continues to be loyal. He said the squabble has cost his City a lot of value in plans that are to come for the existing Chelsea shopping plaza. Ash said that before DeMoulas acquired the Mystic Mall in Chelsea, the best offers for the property were from a gigantic self-storage facility. That, he said, would have never allowed the area to attract a Starbucks, restaurants and, perhaps, the new FBI Regional Headquarters across the street. Now, he is worried that exciting future plans for remaining properties might be thrown out. The Board put a new leadership team in place on Monday as well. Felicia Thornton, a former Albertson’s Supermarkets executive, will take Arthur T.’s place as operating chief. Also, former Radio Shack Corp. president James Gooch will be the chief administrative officer. There was no indication of what the future might hold for the unopened Revere store or for the expansion of the Chelsea property.